I've been going through a lot of system P/C dat files in DAT-o-MATIC and comparing to existing data online regarding releases and regions. I've compiled a list of differences between No-Intro and the major sites for each system. I tried to find multiple sources before bringing any of these up so if you see something I missed, please let me know. [GBA] Battlebots - Design & Destroy - Re-release of Battlebots - Beyond the BattleBox, but with a few bug fixes. It was marketed as the "sequel" to the original. [NES] Bubble Bath Babes - Adult version of Mermaids of Atlantis - The Riddle of the Magic Bubble released by Panesian. [NES] Mike Tyson's Punch Out!! - Original release of Punch Out!! before they decided to drop his character after he lost to James "Buster" Douglas. [NES] Stadium Events - Original release of World Class Track Meet before Nintendo owned the rights to the Family Fun Fitness mat. [SNES] Cannondale Cup - Release of Exertainment Mountain Bike Rally that doesn't require the Exertainment system. [Vectrex] Mine Storm - Original release of Mine Storm II before the level 13 bug was fixed. Again, these are the differences I found when comparing to the major websites for each system. I could be out of line with how No-Intro sees things so please let me know if some of these are this way on purpose. Last edited by nicholaus on 27 Feb 2018 16:00, edited 25 times in total. Thanks for this research (and your other suggestions on the DOM). :3 A lot of good stuff here. C. V. Reynolds wrote: Thanks for this research (and your other suggestions on the DOM). :3 A lot of good stuff here. Thanks. I added Atari 5200 and Jaguar to the first post as well. Will go through Game Gear when I can find the time. Donkey Kong Country - Competition Cartridge (USA) - This is listed as a clone of Donkey Kong Country. This is a 5 minute timed version of Donkey Kong Country used in the PowerFest 94 competition. The other PowerFest 94 games are listed so I think this one should be as well. There really is only one Powerfest '94 game (well, two variations. But one has been only privately dumped). For whatever reason, the dumper on PF94 dumped each of the ROMs on the cart as a separate game but they should run together, much like the Nintendo World Championships games. I believe it was used in both Powerfest 94 and Blockbuster II, but could be wrong. Campus Challenge 92 has also been dumped into separate roms like Powerfest, but I think it was dumped from a repro cart and not the original source so I'm not sure how No-Intro would like to handle it. I think it's dumped into multiple roms because each game is on it's own EPROM. What is the purpose of this thread? Do you want us to remove the listed games? 4 in 1 + 8 in 1 (World) - There's 5 of these. I haven't seen anything about these seeing a release in the US. Jurassic Boy 2 (World) - I haven't seen anything about this seeing a release in the US. What exactly is your point about these? Are you implying the region shouldn't be "World", because these games haven't seen a US release? The ROMs are the same for the two territories the games were released in, Taiwan and Europe, and hence are "World" releases. There are many Game Boy games that are marked World but were not released in one or two territories. Off the top of my head, Alleyway, which did not see a China release. Tauwasser wrote: What is the purpose of this thread? Do you want us to remove the listed games? My guess is "World" has an implication of release in all three of the largest console video game markets: Japan, US/North America and "Europe". The thread is meant to point out inconsistencies I see in the P/C dat files. Specifically, in the GBC ones you pointed out, you're correct that they were released in Taiwan and Europe, but the P/C dat file has USA listed for it as well. I don't have a problem with it being listed World, but it seems some of the P/C dat files assume that USA is a region for some "World" releases when that's not the case. This thread was me pointing out what looks wrong. I just wanted to post what I saw looked incorrect. Last edited by nicholaus on 23 Jan 2018 17:58, edited 1 time in total. nicholaus wrote: The thread is meant to point out inconsistencies I see in the P/C dat files. Specifically, in the GBC ones you pointed out, you're correct that they were released in Taiwan and Europe, but the P/C dat file has USA listed for it as well. I don't have a problem with it being listed World, but it seems some of the P/C dat files assume that USA is a region for some "World" releases when that's not the case. Ah, I wasn't aware of the P/C entries that are auto-generated. I see "(EUR PARENT) (USA PARENT) (JPN PARENT)" in the Reg. Parent field. It might well be derived from selecting World region in the drop-down list. Before changing anything tho, I'd like some input if changing this manually will corrupt the DAT creation or if the field is updated regularly from the drop-down selection (if that's what causes it in the first place). Awesome. The other issues are mainly just inconsistencies. Jaguar has a few games released from Songbird Productions whereas most of his Lynx stuff isn't listed. I consider them a homebrew since they were founded after the system lifespan, but some may not. GB NBA Jam has a parent of NBA Jam TE when all other consoles list them as separate. SNES DKC Competiton has a parent of DKC when Powerfest 94 has each game separate from their parent. Mainly things like that plus a few regions I question. Also added Game Gear to the first post. I cleaned up the first post and added Atari 2600. There were quite a few Atari 2600 roms incorrect or outdated. The post should now be clear as to what needs to be done. If anyone wants to verify the information I posted so the No-Intro community can have more accurate rom data, that would be appreciated. Donkey Kong Country - Competition Cartridge (USA) - This is listed as a clone of Donkey Kong Country. This is a 5 minute timed version of Donkey Kong Country used in the PowerFest 94 competition. Other PowerFest 94 games are listed as separate games. Needs to be separated from its parent. International Superstar Soccer (USA) - No proof this was released in USA and most sites say it was released in Central America or Mexico instead, like Super Copa, which isn't listed as USA. Needs USA region changed to BRA (or Mexico). International Superstar Soccer Deluxe (USA) - Same reason as International Superstar Soccer. Needs USA region changed to BRA (or Mexico). Star Fox - Super Weekend (USA) - This is listed as a clone of Star Fox. This is a 4 minute timed version of Star Fox and has an exclusive bonus level that the original is missing. It was also commercially available through Nintendo Power magazine. Needs to be separated from its parent. Regarding Super Copa and International Superstar Soccer and International Superstar Soccer Deluxe, the packaging for these games is identical to any game released in the US. To say that they weren't released in the US is pure speculation on the part of collectors. We have no evidence that they were not released in the US, although obviously it would have been in small numbers if it was, given their rarity. For consistency, I would argue they should keep the USA label. 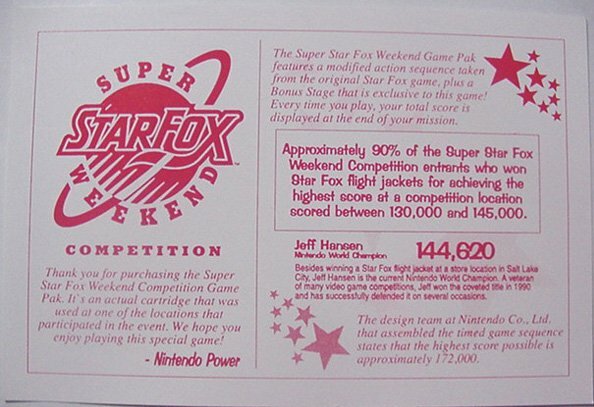 "Star Fox - Super Weekend" is an incorrect title. It should be Super Star Fox Weekend, as per the marketing materials. badinsults wrote: Regarding Super Copa and International Superstar Soccer and International Superstar Soccer Deluxe, the packaging for these games is identical to any game released in the US. To say that they weren't released in the US is pure speculation on the part of collectors. We have no evidence that they were not released in the US, although obviously it would have been in small numbers if it was, given their rarity. For consistency, I would argue they should keep the USA label. I'm cool either way. I threw out both ISS and ISSD since they were packaged like Super Copa and Super Copa didn't have a USA region, but I'm good with adding the USA region to Super Copa. I just wanted to bring up that they weren't consistent. Super Copa does have a US region, though. badinsults wrote: Super Copa does have a US region, though. Not in the P/C dat file.